The stigma (plural: stigmas or stigmata) is the receptive tip of a carpel, or of several fused carpels, in the gynoecium of a flower. The stigma, together with the style and ovary comprises the pistil, which in turn is part of the gynoecium or female reproductive organ of a plant. The stigma forms the distal portion of the style or stylodia. The stigma is composed of stigmatic papillae, the cells which are receptive to pollen. These may be restricted to the apex of the style or, especially in wind pollinated species, cover a wide surface. The stigma receives pollen and it is on the stigma that the pollen grain germinates. Often sticky, the stigma is adapted in various ways to catch and trap pollen with various hairs, flaps, or sculpturings. The pollen may be captured from the air (wind-borne pollen, anemophily), from visiting insects or other animals (biotic pollination), or in rare cases from surrounding water (hydrophily). Stigma can vary from long and slender to globe shaped to feathery. Pollen is typically highly desiccated when it leaves an anther. Stigma have been shown to assist in the rehydration of pollen and in promoting germination of the pollen tube. Stigma also ensure proper adhesion of the correct species of pollen. Stigma can play an active role in pollen discrimination and some self-incompatibility reactions, that reject pollen from the same or genetically similar plants, involve interaction between the stigma and the surface of the pollen grain. The style is a narrow upward extension of the ovary, connecting it to the stigmatic papillae. It may be absent in some plants in the case the stigma is referred to as sessile. Styles are generally tube-like—either long or short. The style can be open (containing few or no cells in the central portion) with a central canal which may be filled with mucilage. Alternatively the style may be closed (densely packed with cells throughout). Most syncarpous monocots and some eudicots have open styles, while many syncarpous eudicots and grasses have closed (solid) styles containing specialised secretory transmitting tissue, linking the stigma to the centre of the ovary. 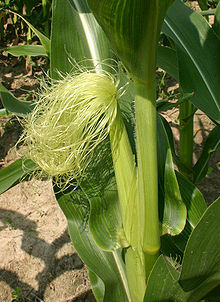 This forms a nutrient rich tract for pollen tube growth. Where there are more than one carpel to the pistil, each may have a separate style-like stylodium, or share a common style. 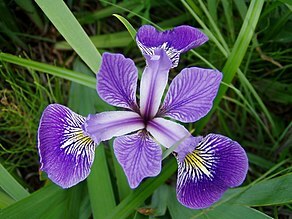 In Irises and others in the Iridaceae family, the style divides into three petal-like (petaloid) style branches (sometimes also referred to as 'stylodia'), almost to the base of the style and is called tribrachiate. These are flaps of tissue, running from the perianth tube above the sepal. The stigma is a rim or edge on the underside of the branch, near the end lobes. Style branches also appear on Dietes, Pardanthopsis and most species of Moraea. In Crocuses, there are three divided style branches, creating a tube. Hesperantha has a spreading style branch. Alternatively the style may be lobed rather than branched. Gladiolus has a bi-lobed style branch (bilobate). Freesia, Lapeirousia, Romulea, Savannosiphon and Watsonia have bifuracated (two branched) and recurved style branches. May be terminal (apical), subapical, lateral, gynobasic, or subgynobasic. Terminal (apical) style position refers to attachment at the apex of the ovary and is the commonest pattern. In the subapical pattern the style arises to the side slightly below the apex. a lateral style arises from the side of the ovary and is found in Rosaceae. The gynobasic style arises from the base of the ovary, or between the ovary lobes and is characteristic of Boraginaceae. 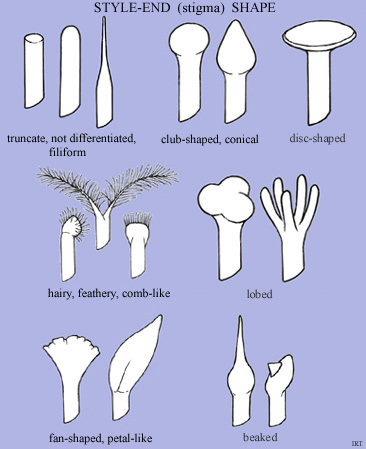 Subgynobasic styles characterise Allium. Pollen tubes grow the length of the style to reach the ovules, and in some cases self-incompatibility reactions in the style prevent full growth of the pollen tubes. In some species, including Gasteria at least, the pollen tube is directed to the micropyle of the ovule by the style. ^ "stigma, n.". Oxford English Dictionary. Retrieved 30 March 2019. Under 6. Botany: "Plural usually stigmas." ^ Edlund, Swanson & Preuss 2004. ^ Weberling 1989, pp. 182-186. ^ "The Anatomy Of Irises". herbs2000.com. Retrieved 27 July 2015. Edlund, Anna F.; Swanson, Robert; Preuss, Daphne (2004). "Pollen and stigma structure and function: the role of diversity in pollination". Plant Cell. 16 (Supplement): 84–97. doi:10.1105/tpc.015800. PMC 2643401. Rudall, Paula J. (2007). Anatomy of flowering plants: an introduction to structure and development (3rd ed.). Cambridge: Cambridge University Press. ISBN 9780521692458. Retrieved 18 January 2015. Simpson, Michael G. (2011). Plant Systematics. Academic Press. ISBN 0-08-051404-9. González, A.M.; Arbo, M.M. (2016). "Botánica Morfológica: Morfología de Plantas Vasculares" (in Spanish). Corrientes, Argentina: Facultad de Ciencias Agrarias, Universidad Nacional del Nordeste. Retrieved 22 June 2016. Weberling, Focko (1989) . Morphologie der Blüten und der Blütenstände [Morphology of Flowers and Inflorescences]. trans. Richard J. Pankhurst. CUP Archive. ISBN 0-521-43832-2. Retrieved 8 February 2014. Wikimedia Commons has media related to Stigma (botany).